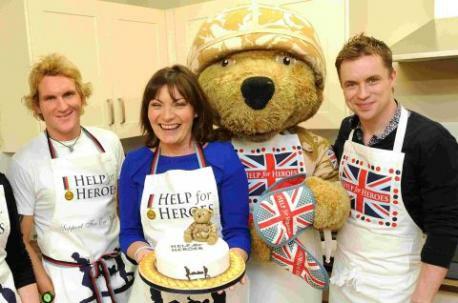 Lorraine Kelly is helping H4H launch their colossal cake sale. The TV presenter is pictured below in her baker’s outfit. The cake sale is being held to raise funds for wounded soldiers, a very worthy cause. Of course, with a television presenter like Lorraine Kelly, news of the sale gets around much better, so the colossal cake sale should be a colossal success. TV presenter Lorraine Kelly and celebrity chef James Tanner were in Tidworth on Tuesday to help launch bake sale with a difference. Help for Heroes is holding a Colossal Cake Sale that is set to raise thousands of pounds to support soldiers injured while fighting for their country. Daybreak presenter Kelly and the show’s resident chef Tanner were at the personnel recovery centre at Tedworth House to encourage would-be bakers to slip on their aprons and have a go. Last year more than 700 people across the UK helped to raise £164,000 by baking cakes and selling them, and the charity is hoping to surpass that figure when the event takes place between Saturday, April 20 to Sunday, May 5 this year. Kelly, a patron of the charity, said: “Considering some of the crazy fundraising things I’ve done in the past, this should be quite easy. “Hopefully I will able to rustle up something tasty. What I like about this idea is that it’s so unique and it enables everyone to get involved. It’s really interesting and fun. Lorraine Kelly is doing a good thing, lending her hand to support the H4H Colossal Cake Sale. Do you support raising funds for injured soldiers? Is it a worthy cause? Do you like Lorraine Kelly? What’s going on with you about all this? Let us know.